Okay...I've been sort of a troll on these forums for a couple of months now, from the time I was considering buying my KJW M700, all the way through building my CO2 rig (by the way, to nodnarb, Brainplay, Chris R, and others I'm forgetting (I know I am forgetting someone; if you provided substantial assistance on someone else's Tanaka/KJ M700, you know who you are): thank you; I'd still be stuck thinking this was a pretty much worthless rifle if it weren't for your posts and guides). I've been using the gun for a couple of months now (bought it in early May, pretty much finished it up in late May using either temporary or stock parts to push the gun to the usable stages) with decent success, but I just recently decided to revisit upgrades in the hope that I can get this thing to the absolute max in consistency. Now, I know I still need to replace the hop up bucking, hop up nub, striker spring, barrel (tightbore I have in there now is too short and not the bore I want) and a few other parts, but as that will cost money, I have to put that on the back burner. I was reading through some of the threads about some of the homebrew mods, and one that I attempted perplexes me: extending the nozzle on the bolt further out. I tried myself (being careful not to bend the nozzle and thus change its shape), but all I was able to do successfully is make some interesting groove patterns in the metal. This leads me to my question: Is there some kind of trick to doing this (I did try twisting as I pulled like it said in this thread, but to no avail)? Brute strength only got me so far (I figure, taking that approach would get me one of two results: either I'd bend the nozzle and successfully extend it, or I'd just make tool marks as my pliers slid off the edge of the metal). Do I need to heat it up (should heating it even be attempted considering its so close to a rubber gasket)? I'm not afraid of leaving more tool marks on the nozzle (after all, that's what they make sandpaper for), so anyone got any suggestions? Never tried the nozzle extention myself. Its debatable whether its necessary or not. The modification page showed some of the arguements between Nobarb and myself on the issue. 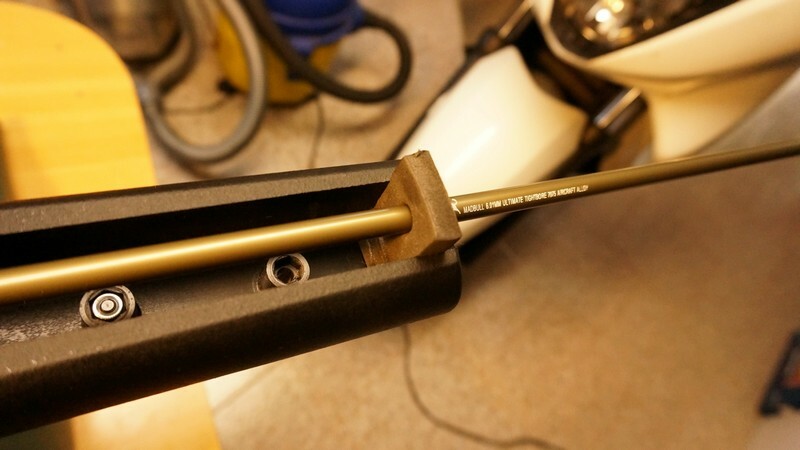 If you're leaving deep tool marks in the brass nozzle then its best to leave it be. Last thing you want to do is put tool marks in the last centimeters of the nozzle that form a seal with the hop up sleeve. That settles it. I'll sand what marks I did leave (not too deep; I was kind of paranoid that I'd dent the nozzle) out, and leave it at that. I'll approach this mod again if I ever need to replace my nozzle (with the replacement nozzle, of course) to lessen the chances of a catastrophic screw-up happening (with my luck, either things will work out perfectly, or I'll end up with a screw-up on par with the Chernobyl disaster). I realize that this is somewhat of a necropost, but I'd like to clear up some confusion about this mod and explain the idea behind the concept. First off, don't bother trying to extend your stock nozzle! It is not long enough to make a difference. Secondly, the problem is that the nozzle does not even enter the "air seal" of the King Arms bucking(and I assume the Nineball bucking as well). I confirmed this by removing the bolt from the rifle, and the hopup chamber with the hopup bucking still inside, but with no barrel. I placed a bb in front of the nozzle and pushed it into the chamber. To my surprise, even with my slightly extended nozzle, NOT EVEN THE BB PENETRATED THE AIR SEAL! It was pushed about 1/2 way into the seal, but the full diameter of the bb was not visible from the opposite side. 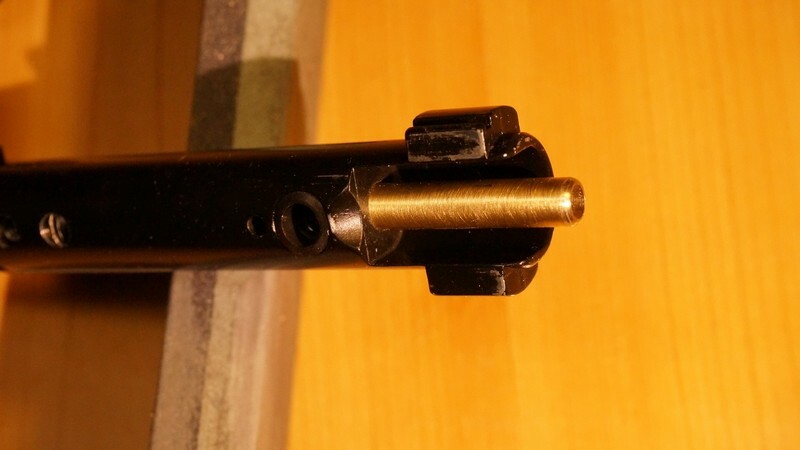 This means when the rifle is fired, the bb has to penetrate the airseal, fly about 6mm until it encounters the hopup nub, then the hopup is applied and it can fly the rest of the way down the barrel. So what's all this business about a longer nozzle? Well there are several considerations that led me to deduce that a longer nozzle would increase consistency. First, the VSR air seal is designed to seal the nozzle while the bb rests in front of the seal, between the seal and hopup nub. Requiring the bb to travel through the air seal as it is being fired is counter to the design, and I believe causes inconsistencies in both fps, and applied hop. The air seal does nothing with a nozzle at this length to seal the nozzle, and may either increase or decrease velocity depending on how much of an obstruction it causes to the bb(if it keeps the bb in the barrel longer at first, it can increase velocity by causing the pressure to build up slightly more before the bb is released, leading someone to believe the seal is doing it's job by allowing more air pressure to go down the barrel). Secondly, the bb should not have to travel a distance before it its the hopup nub. I believe it was The Crimson Falcon who discussed the physics of placing the bb closer to the nub in reference to an AEG nozzle that lead to increased consistency in velocity in one of his rifles. He used a nozzle called a nakiyama (sp?) nozzle. I finally found it one day, and it basically had a cross inside the tip of the nozzle that pushed the bb forward about 1-2mm farther than a stock nozzle. Finally, I was extremely interested in Right Hook Fabrication's Mantis, which is essentially a tanaka rifle with a different stock and maybe a different trigger system. It certainly was a stock barrel and receiver since he said as much in his video. Now in his video, he alludes to machining the receiver to change how the nozzle engages the hopup which builds up the "inherent accuracy." He actually separates those two concepts verbally, but insinuates that this is the reason. So I thought about that for a while, and putting that together with TCF's post, deduced that the closer the bb is to the hopup the more potential consistency one could achieve.Think about it, If a bb has to travel a distance before it hits the hopup, then there is room of weird things to happen. Will it hit the hopup the same way every time? But what if the hopup is pressed into the barrel until it just contacts the nub? Well then there is less room for the bb to act differently before it hits the hopup. This should, in theory at least, increase not only the consistency of the hop applied, but also the fps as well. So there is the theory. I'm a few weeks away from being able to test the nozzle that comes with the KA Chamber conversion kit for the tanakas which I believe to be longer than the stock KJW nozzle. Hopefully it is about 5 or 6mm longer. If not, I'll be investing in a new lathe so that I can make one that is perfect. Why a lathe? 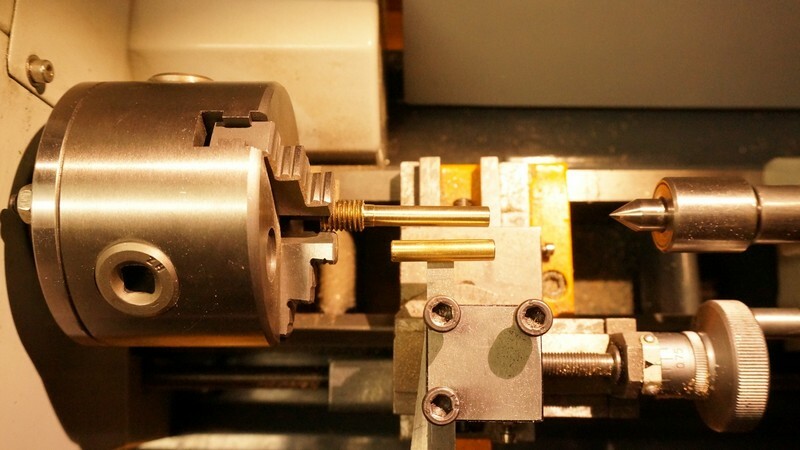 Well the nozzle is 6.5mm in diameter and the diameter is critical since it is press fit into the bolt. I've searched for....along time to find 6.5mm tube that is of the right material, and have come up dry(short of buying in bulk from china). 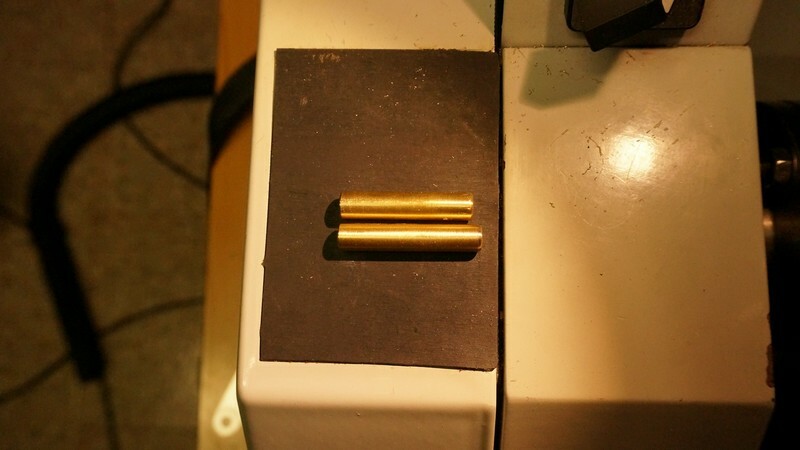 Rather a lathe would allow me to turn down some thicker tube to the right diameter,and I can shape it anyway I want so that it is not only long enough, but seals perfectly in the KA air chamber and prevents marring of the bb when it is pressed from the mag into the chamber. Depending on the performance increase, I'll be selling them. However if the KA nozzle is adequate, then there is no real need since a production nozzle is already available. Bottom line: I believe that this mod, done right, could give Right Hook Fabrication performance from a production rifle(once it is fully upgraded). Wow...I'd completely forgotten that I'd even posted about this. Thanks for telling me that (I'd actually given up on trying to extend the nozzle out further, as I already had some pretty nasty tool marks on my nozzle, and it wasn't budging, short of heating it up with a blowtorch, and I've had very bad experiences with that on a different project involving a KJW gun; rather, I settled for damage control using varying grits of sandpaper). Do let me know how the new nozzle(s) work for you; I'd love to be able to increase performance with a new nozzle and hop chamber (the hop chamber I'm getting anyway, since I've ######'d my old one). There is no reason needed in my book to need a lathe, lol. If I could afford to, I'd rent a storage space and use it as a makeshift metal shop (fully stocked, of course). Also, if you need a beta tester (gawd, I'm a nerd) just hit me up. yeah but I want a lathe! I've thought about it and there is really no easier way to make it. A straight 6.5mm tube is too big IMO to work effectively with the air seal. Well, it'll work but I think it would fatigue the air seal and reduce its longevity. A 6.5mm tube that tapers down to 6mm would be better I think, but I won't know until I test it out. BTW If I ever made them, they would be very affordable. $15 max(more likely 9 or $10). But I'd only do it if I really believe it increased performance in a measurable way. There is no reason needed in my book to not need a lathe, lol. That sounds perfect; I'd prolly buy one. I resume this old 3d I found searching help. First of all: I'm italian so excuse my english. A month ago I bought a M700 Take Down and I was really disappointed for accuracy. At 30 ft shots arrived in a circle of about 11". A DISASTER! I was desperate: in this situation it was impossible also to resell it. I haven't picture of targets becouse I feel shame about shoots. I tried a lot of experiments. First of all I had some improvement removing the muzzle tap #1 on the end of the outer barrel. I think it causes airflux problems being tighter than inner barrel. I suggest to drill #1 at 9 mm diameter. 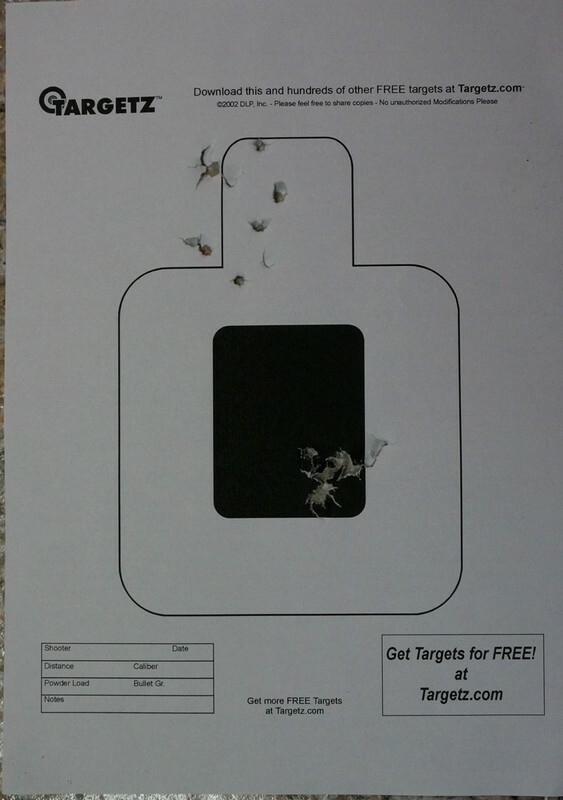 This is the result on a A4 paper sheet at 10 m 32 ft. On high left 10 shoots Madbull 0.36 (Bleah!) On low right 10 shoots 0,32 Royal 5,95 mm. Madbull inner barrel continues to shoot bad. I'm waiting for 5,93 BB's to see if it goes better. However the point is that extending nozzle in my rifle drammaticaly increased accuracy! In my case a fondamental mod. Without it every other upgrade should be a nonsense. Before this work to blow a rice grain in the tube of a Bic pencil was more accurate than shoot with my rifle. Now I can think about it as a really sniper base. This is my experience, pheraps I was unlukily and I found a particular rifle but I hope this can help someone.